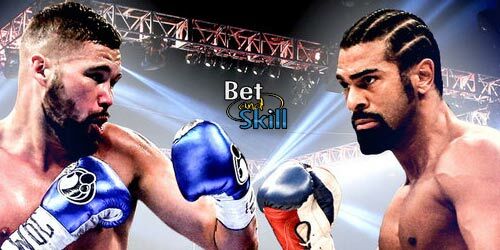 Are you ready for Haye v Bellew on Saturday 4th March 2017? Would you like to watch the fight live on Sky online? SkyBet are giving a free fight pass to all new customers who bet £5 on any boxing market. 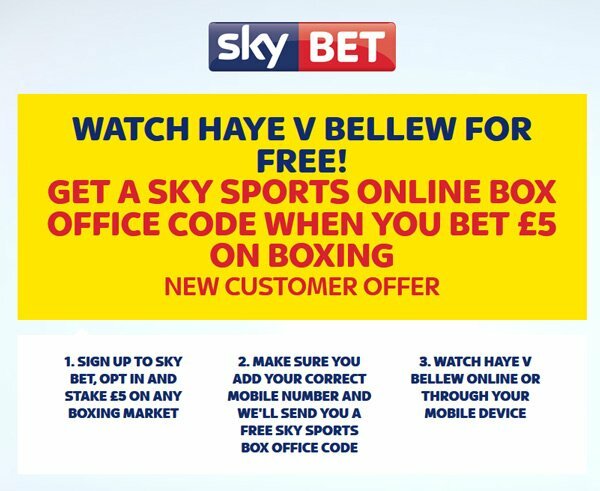 Find below how to watch the Haye v Bellew PPV fight for free online on your desktop, tablet or smartphone! Customers who qualify for this offer will not qualify for any other welcome offer free bet. This offer is for online only, for use on desktop/mobile/tablets - this does not apply to TV PPV. Furthermore, SkyBet offer a number of betting promotions. This offer is only available to new customers aged 18 years and over who register as customers of Sky Bet. For clarity, customers who already hold Sky Vegas, Sky Bet, Sky Poker, Sky Bingo or Sky Casino accounts are considered to be existing customers and are therefore not eligible for this offer. This offer is available from 10:00 Friday 3rd March until 5.30pm on Saturday 4th March (the promotional period). This offer is only available to the first 5000 qualifying customers. Customers must opt in by clicking the button above or by entering the promo code FREEPPV in the 'my account' section within the promotional period. Customers must then stake at least £5 on any boxing market at minimum odds of 1/2 within the promotional period. Your promo code will be issued between 7 - 9pm on Saturday 4th March. Your promo code will only work for the online product of Sky Sports Box Office. Only one offer per customer, per household, per shared computer and shared IP address. "How to watch Haye v Bellew PPV fight for free online"